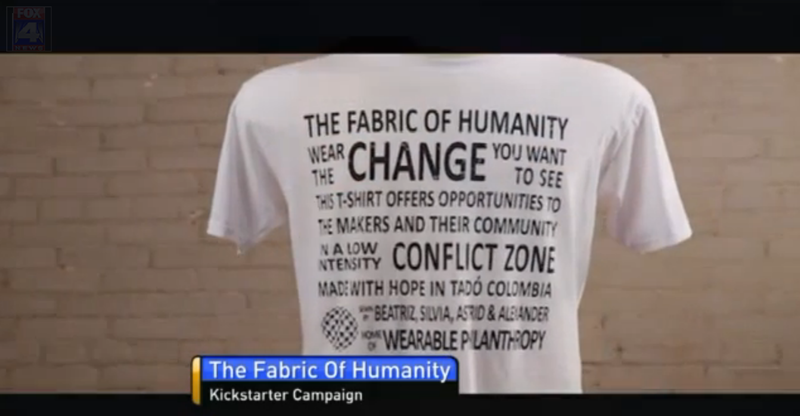 Congratulations to our Client The Fabric of Humanity for their feature on Fox 4 Kansas City! Have you ever wondered about who made your t-shirt, dress or sweater? What it means for her to have this job? Her dreams and aspirations for herself, her family and her community? TheÂ mission of The Fabric of Humanity is to give you a wearable tool to contribute to making this a better world. The Fabric of Humanity is a social enterprise, an organization in which sales support social investment funds dedicated to improving the communities where the clothing is manufactured. Clean water, access to healthcare and educationâ€¦The seamstresses suggest what their communities need, and you decide what causes to support. It’sÂ Wearable Philanthropy. Check them out at thefabricofhumanity.com! Also check them out on Kickstarter!